The supply from the Vincent Avenue gate SES water meter is now intact and there is no leak whatsoever in the pool supply system. 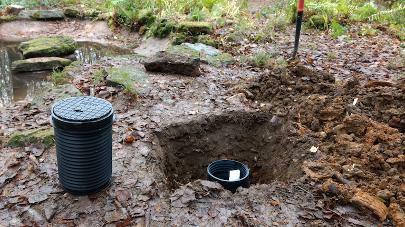 After 22 hours of the water fully on, only a little over one cubic metre of water was used. Formerly due to leakage it would have been many times that due to wastage. Since the addition of a water supply for the country fairs in the 1980s, the pool supply has been shared with that to Great Field. That system was vandalised in the late 1980s and 1990s and is leaking and not in a fit working state, so it's now completely shut off. 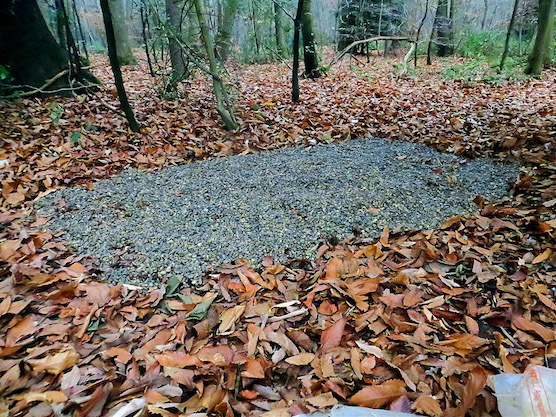 Distribution is at a hatch in Stevens Walk which is now disguised by woodland detritus and this should not be interfered with or the taps altered in any way. The pool feed is now shut off at the pool tap pending repair of the pool, but not shut off at the meter where the meter disc is stationary, showing no leakage loss. Thus the system is back to its pre 1980s fully working status. On 22nd August Tony and I met with two gentlemen from SES Water who traced the supply pipe from Vincent Avenue gate to a junction pit in Stevens Walk by the bottom of Great Field. Within the pit, they found a minor leak as the valve feeding the hose outlet was slightly open. 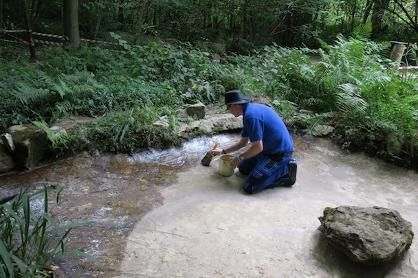 At the pit the trace vanished and they then traced back from the former drinking fountain in Pool Grove at the edge of David’s Crook. This went on a straight line along the eastern edge of David’s Crook and into the strip of woods where it suddenly stopped within sight of the mentioned junction pit. It looks like at some stage the missing about three meters of pipe were replaced with plastic pipe which does not echo on their machines (marked as the signal gap on the map). 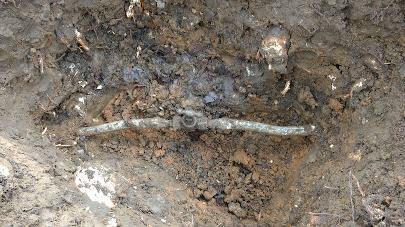 There is disturbed ground in line of the pipe so it is suspected that a former leak there was dealt with by replacing a length of iron / lead pipe with plastic. We were told that from the late sixties until the early eighties black plastic pipes were being used which turned out to become brittle over time and were therefore eventually replaced with the blue plastic pipes still in use today. Tony has prepared the attached map of the approximate pipe run for further reference. Water supply to the junction pit was ok with decent pressure and when the pit was eventually cleared of soil and roots, a blue plastic pipe came to light running off towards Great Field. 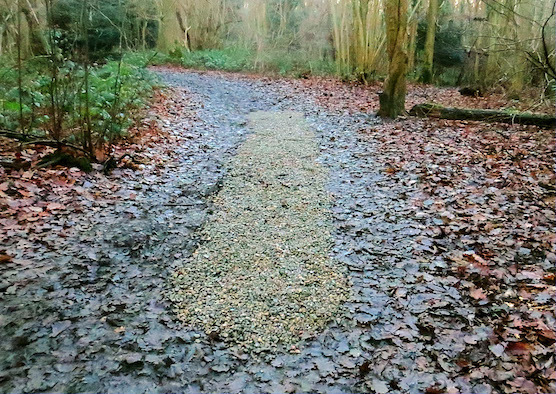 At first we thought that this could be what feeds the new installation around Great Field which we – perhaps mistakenly – thought had been installed by Thames Water and fed from Selsdon Vale. However, later an alternative theory developed that this might be the replacement plastic pipe leading in a loop up to Linden Glade pool. pretty much in the opposite direction. Only a bigger dig will reveal which of the two apply. The conclusion was that the pipe from Vincent Gate to the junction pit was sound and any leaks would be in the stretch from there to Linden Glade, the initial plastic pipe (if it is not the blue plastic pipe leading off in pretty much the opposite direction) and the area around the former drinking fountain being particular suspects. Apparently SES have no technology other than digging to establish this with more certainty. 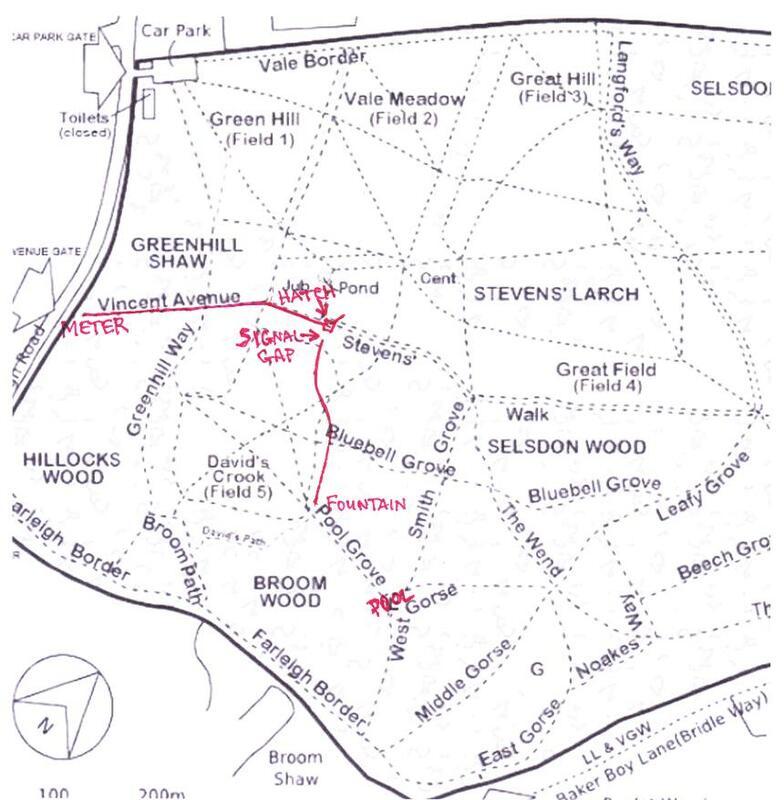 The alternative would be to bury a new plastic pipe for which a drag plough could be used to create a suitable trench although said plough might not cope with tree roots in the final part of this run from Davids Crook to Linden Glade. The cheapest solution might be to purchase a bowser trailer to haul water up to the pond as needed. SES are currently disposing of a number of these no longer suitable for their original purpose. We would have to find somewhere to store it. SES Water have agreed to contribute £500 to the project. Tony had been wondering if closing the slightly open hose valve in the pit might have been enough to restore supply to the pool and on 23rd August he opened the valve in the pit. Water did indeed emerge, for a while at least. By 16:30 he found that the trickle had stopped again, perhaps because Selsdon had come home and was taking showers, watering the garden etc. etc. He's left the valve open and has taken a reading of the meter, will take another one tomorrow to see how much water is coming through and how much is being lost. 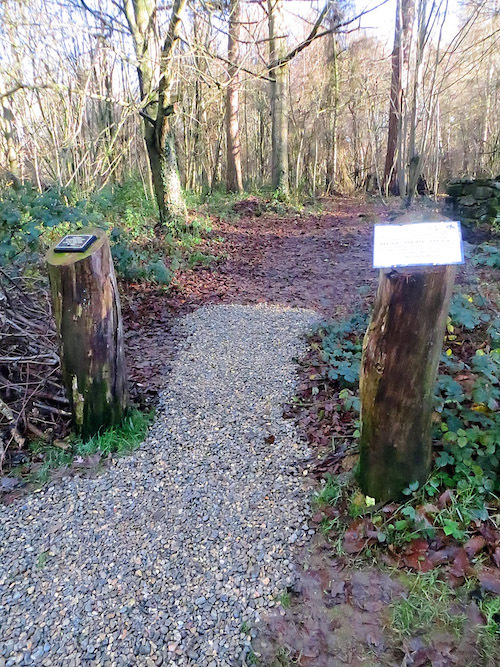 Extensive repair work was done on the reserve perimeter walk in November including on Greenhill Way, Farleigh Border including the West Gorse corner, Noakes Way south, The Wend, the Courtwood Lane entrance and Vale Border. 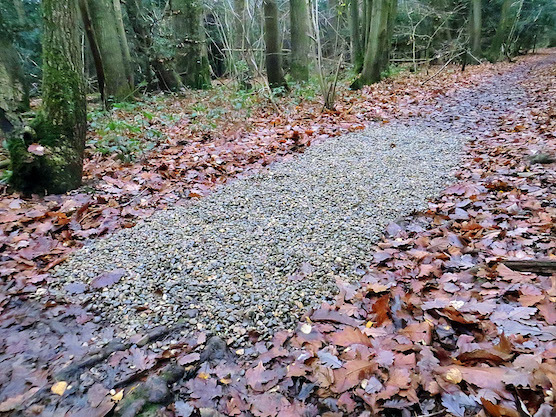 In Linden Glade where last year's part woodchip repair was failing, all three paths of the triangle were relaid with adequate gravel. 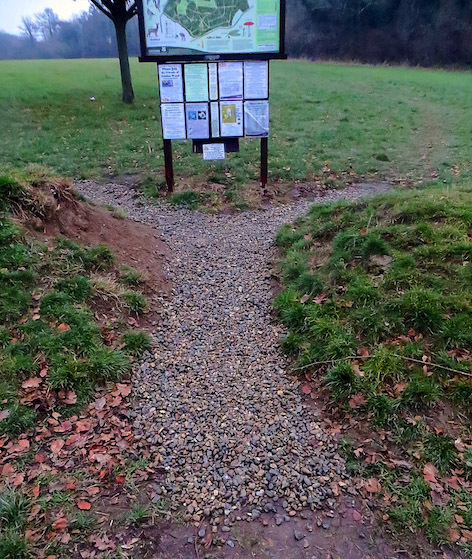 Additional gravel was laid at two points in Middle Gorse, in part again due to last year's woodchip repair proving inadequate, and minor repairs were carried out on the path under a yew tree in Beech Grove and at the Great Field entrance to Smith Grove. Finally the damage done by the pickup's repeated runs through the Jubilee crossroads at the junction of Vincent Avenue and Steven's Walk was made good, leaving all routes there dry for walkers. 18 tonnes of gravel were used in the month, bringing the phase 2 total to an end with the full 50 tonnes budgeted for spread. During these two months extensive repair work was carried out using 16 tonnes of gravel, the bulk of it in October. 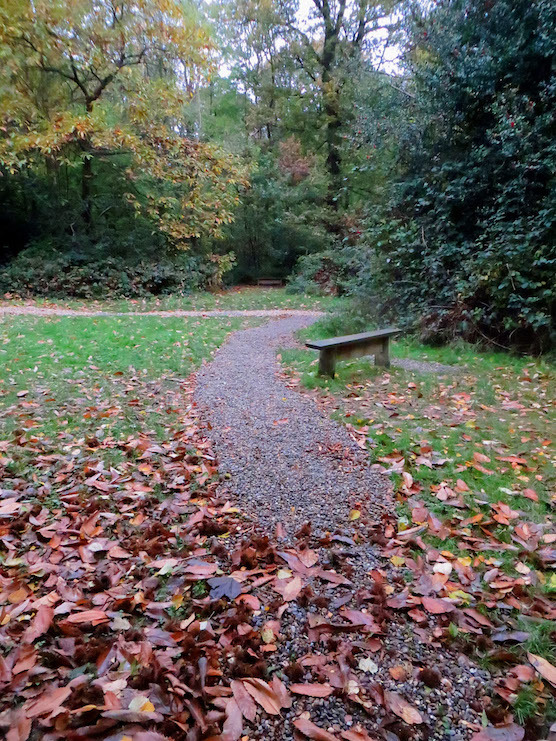 Path areas repaired in September were sections of Leafy Grove and Linden Grove using three tonnes of gravel. Areas extensively repaired in October included all three Gorses together with the Smith Grove junction with West Gorse, the junction of Vincent Avenue and Stevens Walk on the crossroads at the link between Field 2 and Davids Crook (see photo), the junction of The Wend, Leafy Grove and East Gorse, the Y junction in Greenhill Way, the entrance areas to Davids Crook from both the Field 2 link and Greenhill Way and finally further areas of Leafy Grove. This October work used 13 tonnes of gravel. The total of gravel used to date in Phase 2 is 32 tonnes leaving allocated money for a further 18 tonnes. The total materials used in both repair phases 1 and 2 is a little over 42 tonnes of gravel and 7 nominal one tonne bags of woodchip. 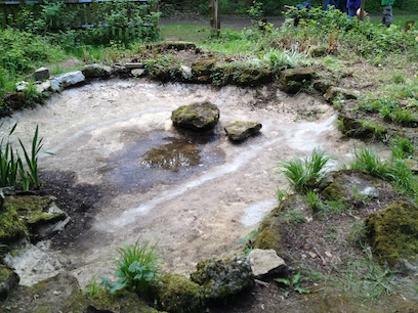 We are sad to have to report that the pond in Linden Glade, which we restored last year, seems to have sprung a leak. 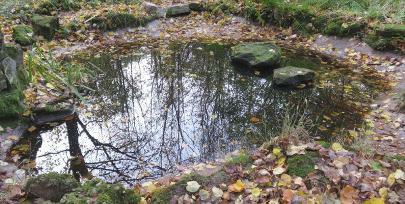 There appear to be cracks in the liner so that the pond does not fill fully although there is some residual water. We are currently considering how we might address this – any suggestions would be most welcome. No work was done in July since it was too dry. 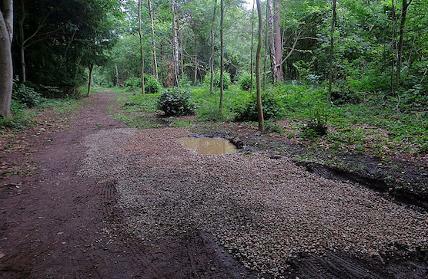 The wet spell in early August exposed all the worst puddle areas, enabling 6 gravel work days during the 3rd to the 11th period when 10 one tonne loads of gravel were used. 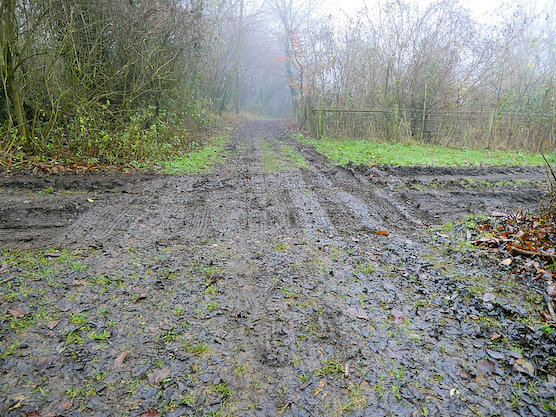 The two major puddles in Greenhill Way, the three in Farleigh Border and the second dip in East Gorse were filled, together with some mud covering on that route. 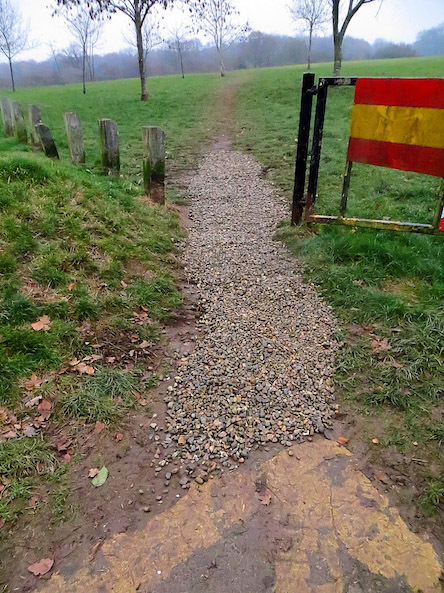 That means the entire western and southern border path route from Field 1 through to the junction of Noakes Way with East Gorse has had all major repairs completed. 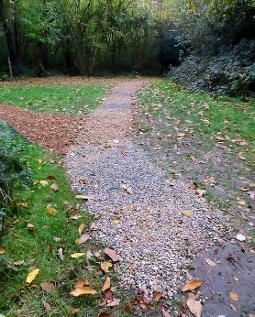 Additionally Middle Gorse, Linden Glade and Pool Grove had additional gravel added to existing repair areas. 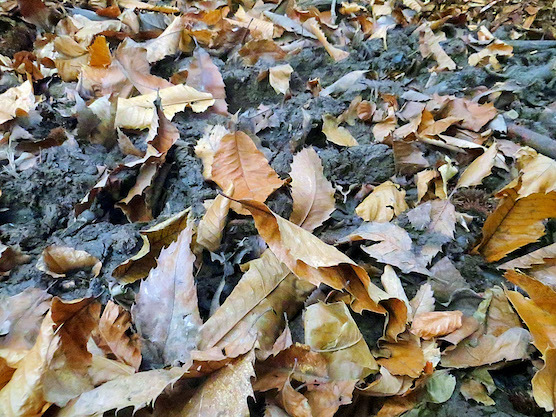 The major puddle in Leafy Grove and the puddle in the grass on the southern flank of Great Field have been filled. Special attention has been paid to the extensive damage the contractors caused at the West Gorse - Smith Grove junction. The huge ridges of earth have been broken down to fill the deep ruts, with raking plus rolling using the pickup tyres to level the ground. 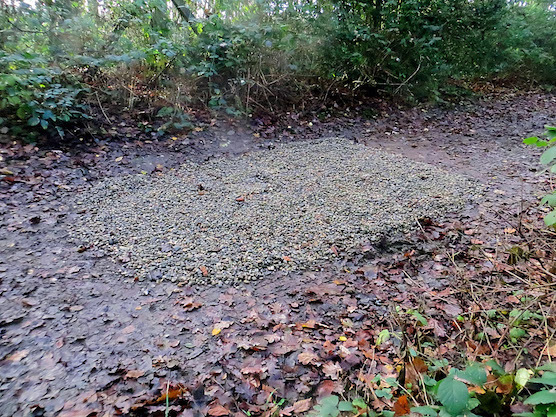 Then some two and a half tonnes of gravel has been used to surface the extensive mud over a large area. 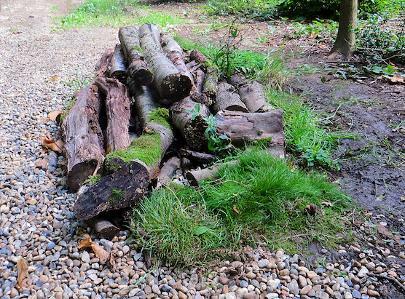 Since there is a persistent puddle there, a reservoir has been left at the rear to take up surpluses of rain, but this has been disguised by a log pile constructed over it. Finally on an additional work day the log pile has been landscaped with grasses and woodland plants taken from the area and planted around it to enhance the appearance and establish root systems to take up water surpluses. Photos below show the puddle before and after. A Mitsubishi L200 pickup truck is now used to bring in a tonne of loose gravel at a time, with the gravel rake off and spread in one operation. 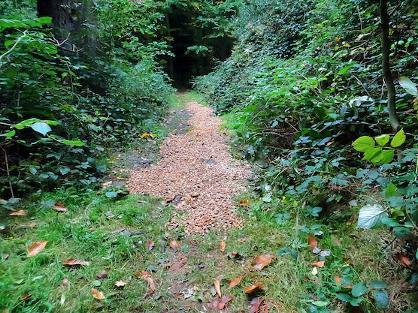 In May two one tonne loads were used to improve the previous repairs in Middle Gorse, Avis Grove, The Wend, the Great Field exit to Courtwood Grove and fill a hollow the contractors had caused at the Leafy Grove/Stevens Walk junction. 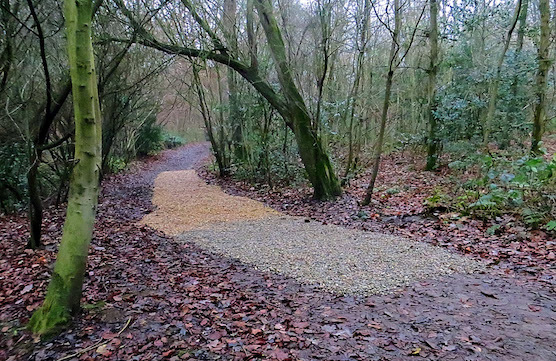 In June a third tonne load was used to complete The Wend repairs with a major stretch of the section between Bluebell Grove and Leafy Grove given adequate cover to cope with this stubbornly muddy path. With dry weather and hard soil no further repairs can be made until the return of the wet season. photos below show: Pickup Truck, Repaired hollow at Leafy Grove/Stevens Walk junction. Of the original 87 or so name boards put up 5 or 6 years ago, 15 have fallen or been stolen. 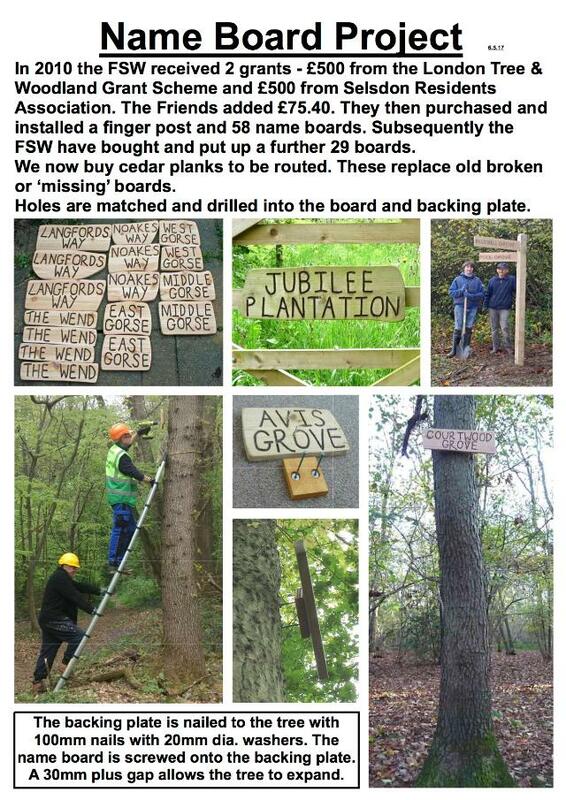 On Sunday 7th May David, Neale & Jim put up the first 8 boards using a new method, and did a repair job on 1. 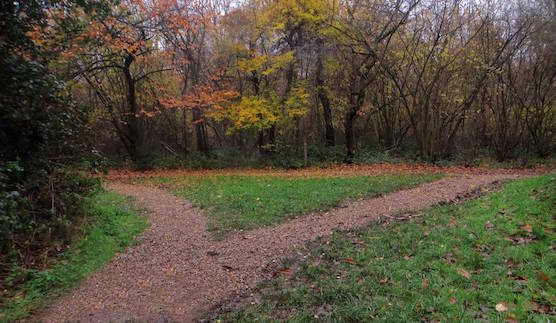 Refurbished or new – Broom Path, Farleigh Border, 2 x East Gorse, 2 x The Wend (I was found on the ground), Beech Grove, Stevens Walk. We also added another nail to extend the life of an old Farleigh Border board. As a tree grows it expands and a number of our name boards have been (& will be) pushed off their trees. We decided that we should try another method of mounting the boards. The cedar mounting blocks are prone to splitting and are being replaced by 19mm resin-bonded plywood. We now use longer nails into the tree and screw the name board to the mounting board around the nail head whose diameter is increased by a 20mm stainless steel washer. This leaves a gap of 30mm plus to accommodate the tree’s expansion and this will allow any ivy to creep behind the name board. I had not been happy with the 4mm x 100mm stainless-steel nails we had purchased for this project because they had annular rings that would make them impossible to extract. 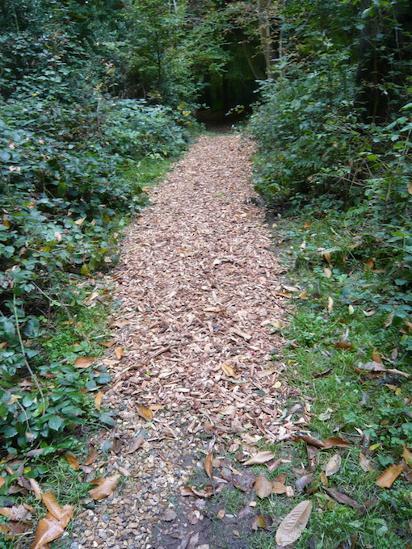 Simon Levy (Forestry consultant to the Council) would not have been happy, due to danger when cutting or machining. For reasons, we won’t go into (divine intervention!) I mislaid them so I bought a trial batch of 4.5mm x 100mm outdoor corrosion resistant green nails. These nails have several advantages: Their green colour, resistance to corrosion, larger diameter for durability, easier to extract. I had devised a method for mounting them but it was not reasonable to hammer the nails in further than was necessary and the nails were longer than I had envisaged (the next size down being too short). So my method was not practical. I am very grateful to Neale for finding a better method. We still have 2 refurbished name boards and need 5 new ones routed. We are grateful to Jim for experimenting to see if he can do this but it is not easy. Inevitably more name boards will fall and their mounting will be upgraded. 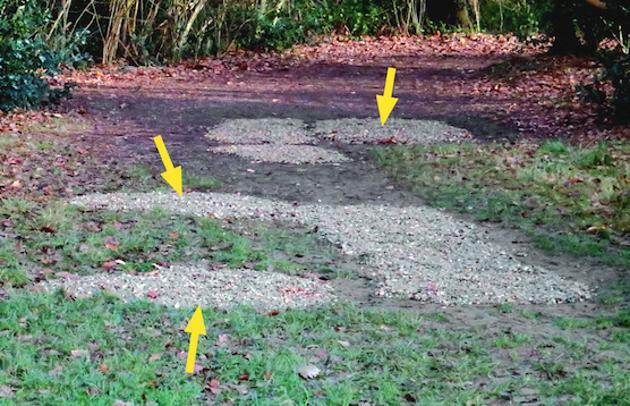 A plan to address the muddy puddles in the paths throughout Selsdon Wood was first formulated in 2015. 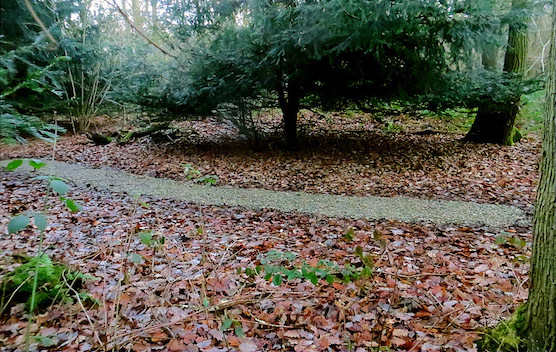 The idea was to purchase gravel which could be used to fill the hollows in the paths where water and mud are most frequently seen. David researched the locations and made preliminary enquiries about suitable gravel. Sara Bashford agreed that we could apply to her Community Budget for the full cost (£432). 23/9/16 - Delivery of 1st Batch of Gravel - In summer 2016 Tony Flecchia also looked into suitable materials and on 16th September he ordered 150 x 25 kilo bags of 20mm gravel at £2.40 per bag plus VAT from Seccombe Builders Merchants, West Wickham. The company were very obliging about delivery and agreed to deliver the material at 2.30pm on Friday 23rd September. Tony was there to allow access and the Seccombe lorry driver (Rob) drove to the top of Field 1 and offloaded three 1.25 ton pallets each with 50 bags. Tony wrapped these with orange safety barrier mesh to keep prying hands off. See photo below left. 25/9/16 - Distribution of 1st Batch of Gravel - On the Workday on Sunday 25th September, Neale's contact Paul Winter who lives opposite in Old Farleigh Road turned up for the workday with his Frontera 4 x 4 and trailer, accompanied by his wife and sister to help with the loading. Also with them was Paul's little daughter. The three of them and Neale loaded the car and trailer and went to distribute that first load. Ted was present to direct where the loads were going and walking between the locations, and he was joined by John Zareba for a while. While Paul was away delivering the first load Tony turned up and loaded 10 bags into his car, being ready just as they returned to go off the the next point that Ted had advised while they reloaded. From then on Paul and Tony worked with both loaded vehicles together as directed by Ted. Tony did three full trips and Paul four full trips plus a fifth trip with just the remaining eight bags. The 5 people doing the loading handled an average of 30 bags each, a little less for unloading since Ted assisted with that at each point. The entire job was done well within two and a half hours and in one or two places bags were opened and gravel distributed where it was already muddy enough. 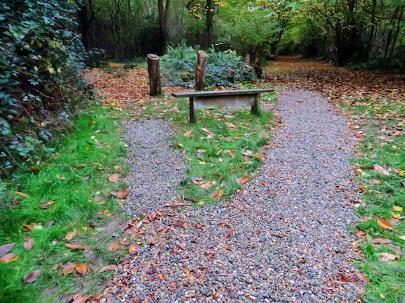 As a trial a couple of bins of wood chippings were also distributed over a couple of potential puddles. We were delighted with how smoothly both days went, delivery and distribution. Paul and his family were an invaluable help while enjoying themselves too. Paul also kindly cleared the empty plastic bags and the three large wooden pallets for us, saving us a disposal problem and has said that he'll be pleased to help again. He has also offered more gravel and wood chippings through his company as a donation. While others were dealing with loads, Ted showed Paul's little daughter a number of the woodland fungi which she clearly enjoyed. She was also thrilled to find a small ground beetle and though she was too nervous to pick it up she was delighted to see it running about on Tony's hands. 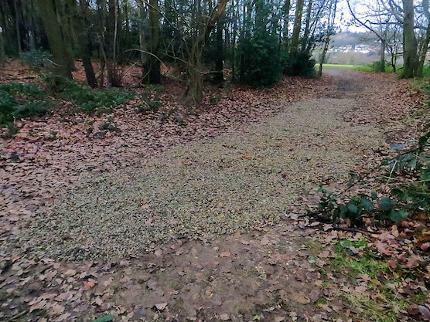 The photo above right shows the gravel in Linden Glade and the photos below show Paul's vehicle and team, the gravel by the puddles in Avis Grove and the laid gravel in Middle Gorse. 5/10/16 - Neale reported that Paul had more gravel waiting for us in his yard and was making plans for delivery and disrtibution. 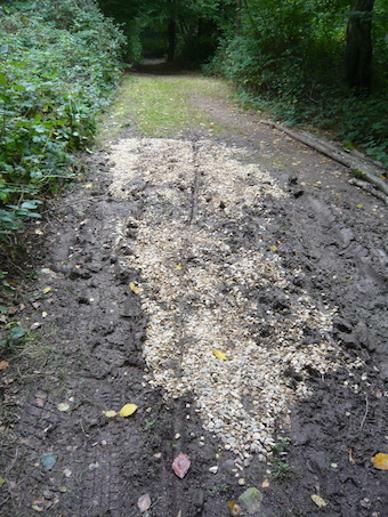 8/10/16 - Repairing the Wend 1 - Tony laid one bag of the gravel by the old Beech tree in The Wend to make a dry single-file path in preparation for the Fungi walk on 9/10/16. 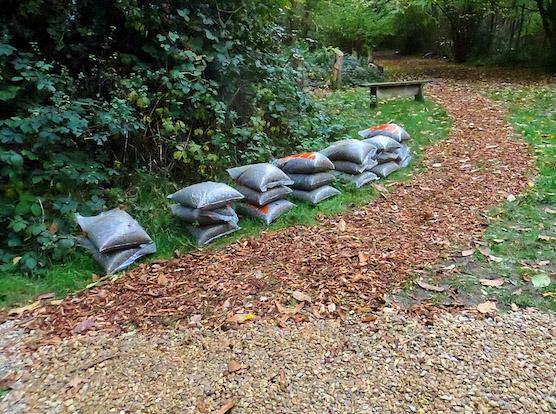 19/10/16 - Delivery of 2nd batch of Gravel donated by Paul - Neale and Tony took delivery of another 100 bags of 20mm gravel and 2 cubic metre bags of chippings. 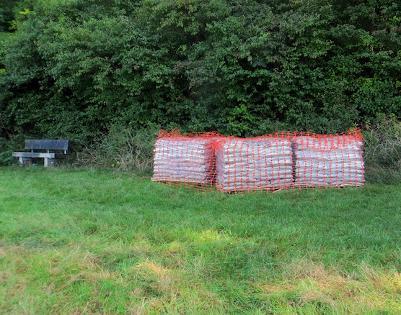 These came as a donation from Paul, As before they were delivered to the top of F1 beside the FSW seat and plans were made to distribute the bags - and perhaps even lay some of the gravel on the following weekend (23.10/16). 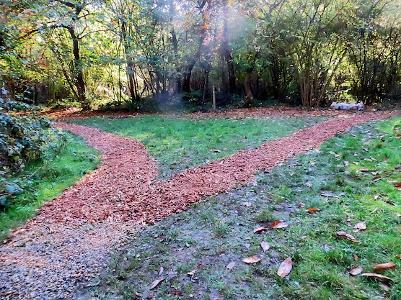 20/10/16 - Repairing the Wend 2 - Tony revisited the muddy site by the old Beech tree in The Wend and distributed the gravel that had already been delivered to that spot on 25th September, concentrating on making a sound path on the high side of the puddle (see photo right). 23/10/16 - Distribution of 2nd batch of Gravel - In addition to the two one ton bags of wood chips and 100 bags of grave delivered on 23rd, Paul arrived with two one ton bags of wood chips on his trailer. Tony had already loaded up his car with 12 bags of gravel. 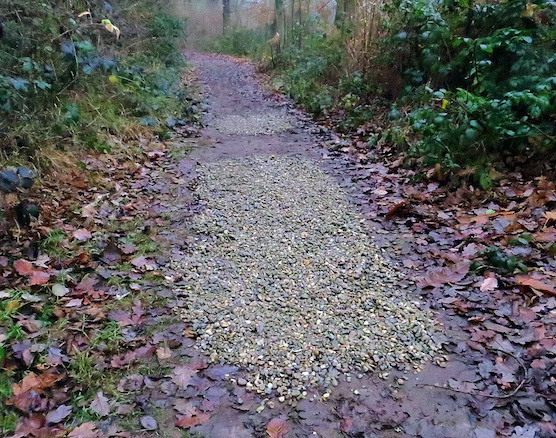 They went to Middle Gorse first, where they dropped and spread one and half tons of wood chips, followed by 12 bags of gravel on top on the centre line, making it all comfortable to walk through now. Paul had kindly brought rakes and shovels with him which helped a lot. They then went on to The Wend and spread the remaining half ton of wood chips to complete Tony's work and delivered the other two one ton bags of wood chips plus the usual one-third ton of gravel bags to Linden Grove, which now had the two one ton containers of wood chips and about 30 bags of gravel stored ready for when the mud there gets bad. 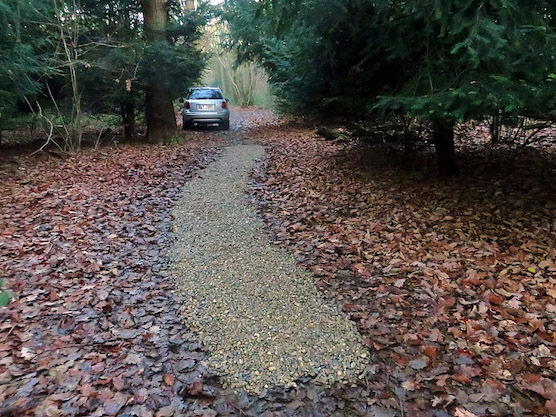 Next a batch of gravel bags was delivered to the Avis Grove point close to Beech Grove where the small yew tree intrudes over Avis Grove and the path gets very muddy there. Then Paul delivered a large batch of gravel bags to the low point of East Gorse near the border to add to the batch already there, while Tony delivered a dozen gravel bags to The Wend just beyond and below the junction with Noakes Way which David had indicated gets bad. Finally Paul and co. took the last few bags of gravel to the junction of West Gorse and Farleigh Border while Tony stored away the orange mesh and unlocked the gate ready for departure. There were many helpers. Paul brought a strong younger male relative as well as his female helpers from last time. FSW Tony, Neale, Linda and John worked to load/unload, while Ted directed to delivery points. The work was completed by just gone 1pm. Below and left - Job done!!! 24/10/16 - In The Wend the gravel alone in the puddle hollow (see photo by 20/10/16) felt like walking on an air bed, very unstable. 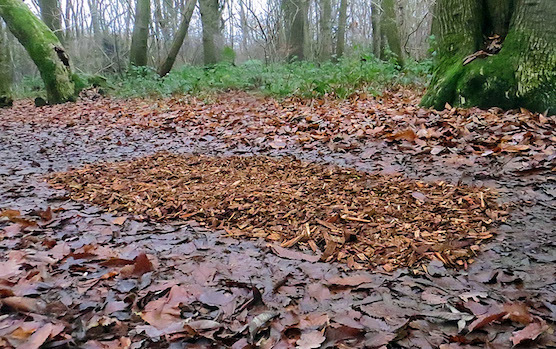 Wood chips were added on top and had soaked up the moisture by the following day leaving even the worst puddle hollow stable and dry to to walk across. 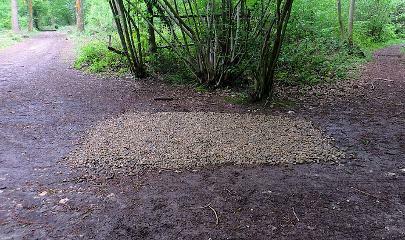 The photo rt shows what had been a severe muddy puddle by the great Beech trunk in The Wend - now fully repaired. 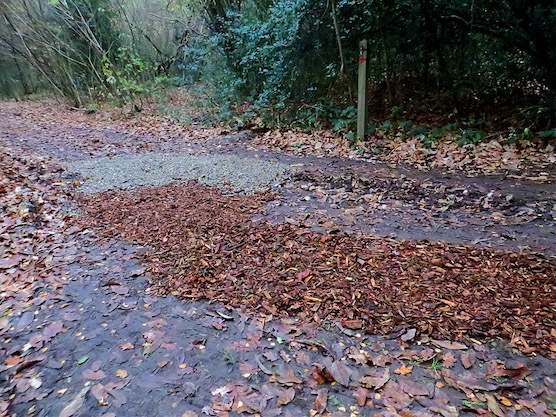 28/10/16 - Two bags of wood chip had been left in Linden Glade and Tony hand laid some of it over the mud along the path from Pool Grove to West Gorse south (see below). 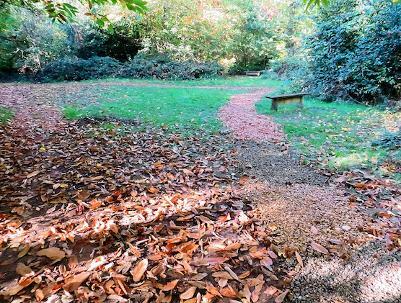 When the rains come this will probably need more wood chip and gravel.One of the Limes in Linden Glade is looking good in autumn yellow. 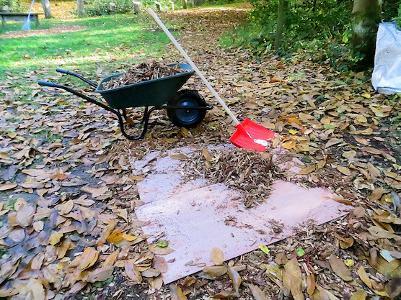 The woodchip in too heavy to move one tonne bags is very difficult to use since it's impossible to dig a shovel into the coarse material and lifting out by hand takes ages. 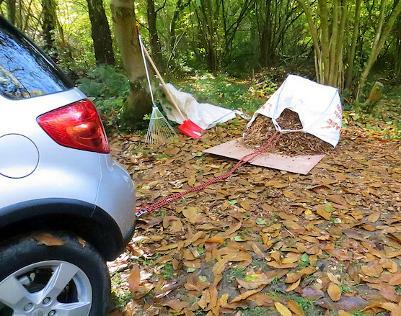 Therefore I used my car with a towrope onto the bags to tip them onto flat boards, shown in the third photo. That made it easy to load the chips into a barrow using a wide snow shovel, six or seven shovelfuls filling a 90 litre barrow. I used my own lightweight wheelbarrow (fourth photo) that goes into the car. I've used all of the two bags of woodchips and a dozen bags of gravel. The remaining 21 bags of gravel there isn't sufficient to cap all the treated sections, so I've left them for capping the bad points that will no doubt crop up as it gets wetter. The builders merchant's empty 1 tonne bags I've put in the store, they can be returned when we get the next gravel delivery. The newly purchased expanding lawn rake is also now in the store ready for use on the pool. 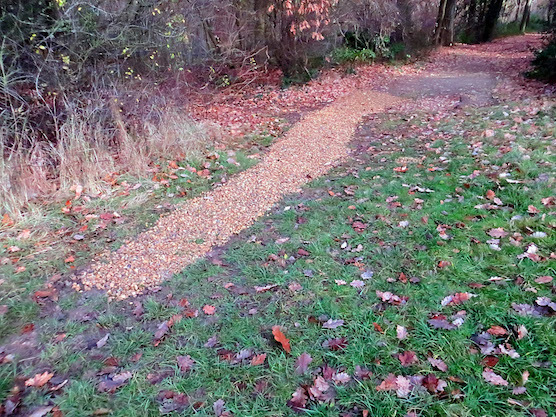 8/11/16 - (Report by Tony Flecchia) - Today I used the remaining 17 bags of gravel at Linden Glade to cap and rake over the woodchip on the West Gorse to Pool Grove link, it was two bags short of what was needed unfortunately. Photo 1 below. After a break to get some feeling back in frozen hands I did two trips transferring 20 bags of gravel from Beech Grove-Avis Grove junction where there was an excess and where none was needed yet. Those are now ready at Linden Glade for me to gravel cap the link between the two halves of West Gorse. Photo 2. A lot of rain is forecast from later tonight through to late tomorrow so that will probably have to wait until Thursday. 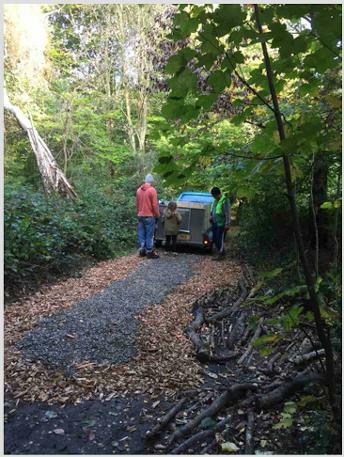 10/11/16 - (Report by Tony Flecchia - also photos below) - Today I finished the Linden Glade work by gravel capping the link between the West Gorses (photos 1 and 2). I also I extended the Smith Grove end to cover the muddy lead-in. While working up there I've noticed many walkers regularly divert into the pool area to look at it, and in doing so have created a deep puddle by the left of the bench. 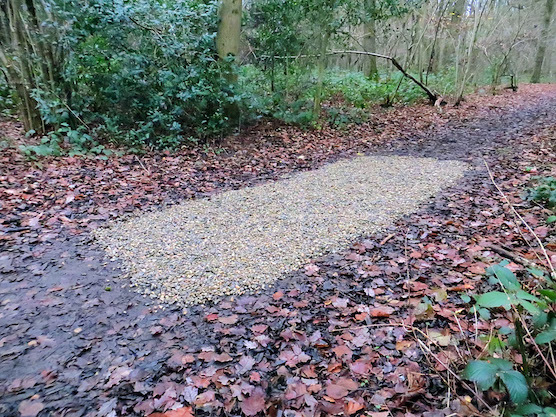 Therefore I've filled that puddle and added a gravel diversion link for them (photo3). 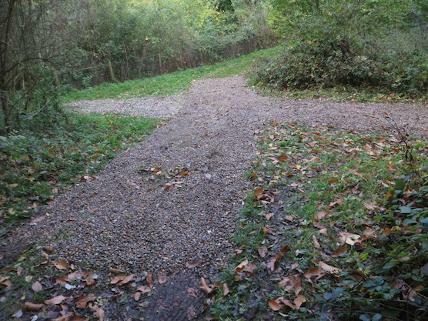 Where I'd been short of gravel at Pool Grove end I've completed the link (photo 4). Middle Gorse: 10 foot extension to repair where we'd fallen a little short last time. Photo 1. 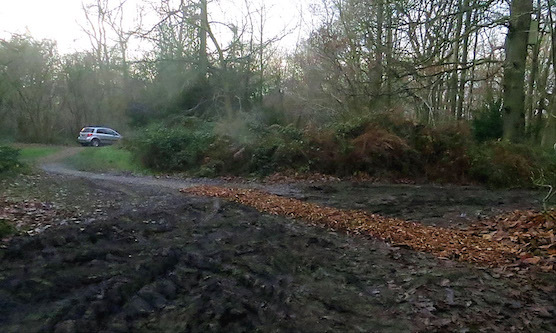 Junction of West Gorse and East Gorse at the border: Woodchip and gravel capping added to complete area, and also woodchip to fill in the worst of the contractor's tractor ruts across West Gorse entrance. Photo 2. 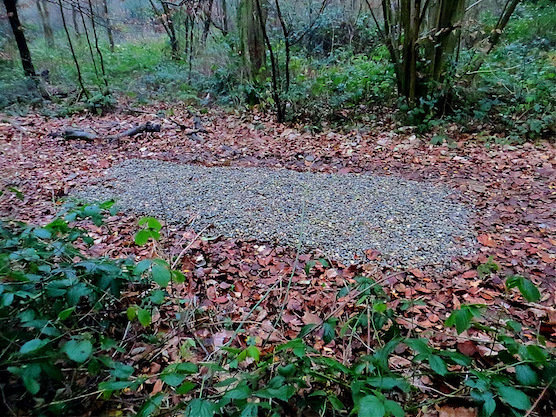 The Wend deep mud hole: Filled with woodchip to stabilise the mud and then thickly capped with gravel. Two photos attached, Before showing the ankle deep mud, and After the treatment. Photos 3 and 4. The bag of woodchip that was stuck out on the field is now completely cleared away. 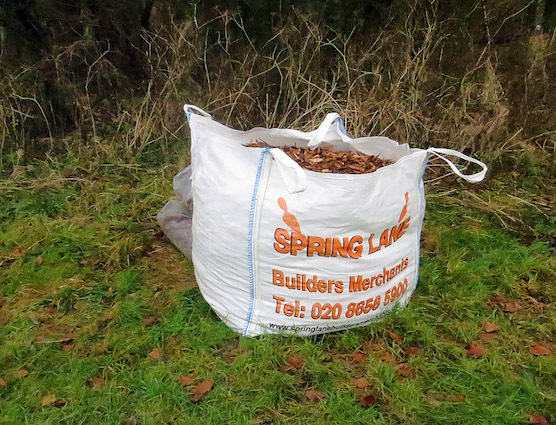 The remaining bag is neatly in store against the wood by Greenhill Way entrance and four polythene bags of woodchip behind it ready for loading into my car when required. Photo 8. 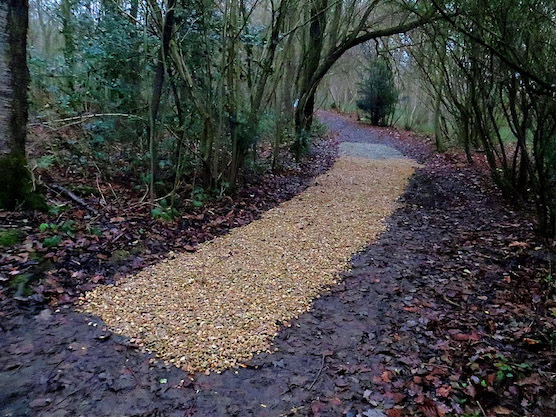 I repaired a muddy patch at at the north end of the first Wend repair with woodchip and gravel and I spread the remaining 8 bags at the Pool Grove/David's Crook junction onto the path route alongside the original repair as this was getting wetter. This makes a twelfth location completed. This is the lighter coloured gravel from Seccombe, but it does darken after spreading. Photo 9. This now completes all activities until rain and mud allow spreading of bags already distributed. Below is a report with map of the full position as of 6/12/16. 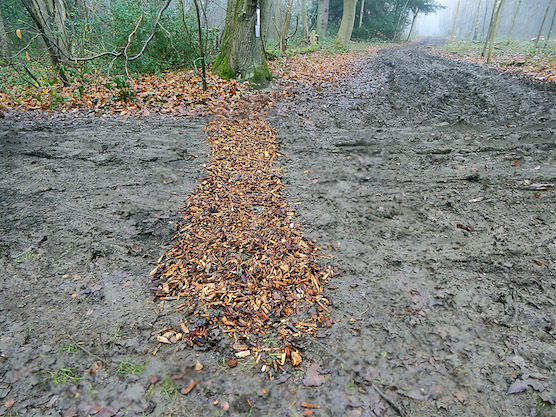 Developing puddle at Great Field - Courtwood Grove junction filled with woodchip. More will be needed as it grows. Photo 1. Minor mud patch in Courtwood Grove just south of Avis Grove capped with woodchip. Photo 2. 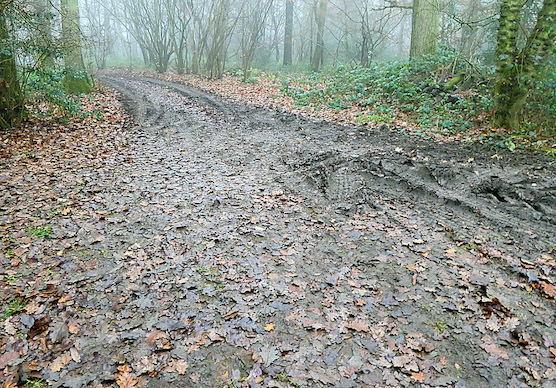 Major mud hollow in Courtwood Grove near the turn towards Great Field filled with gravel. Photo 3. 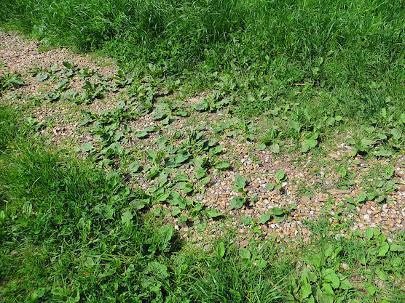 Shallow but long mud patch in Addington Border capped with gravel. Photo 4. Now the Council Contractors have finished working I tackled some of their path damage this morning. 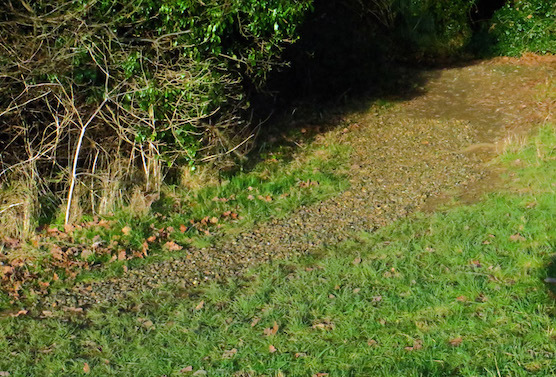 I flattened ruts in Vincent Avenue and Smith Grove and created a dry path across the morass at the Smith Grove/West Gorse junction. See photo captions below for details. With colder weather impending and heavy rain now possible Wednesday night I decided to finish the eastern border work where it's already muddy enough. There were 10 bags of gravel left on The Wend, but with that rutted by the contractors who also split 3 bags, it's not clear where there's a muddy patch. So I loaded the 7 bags and what I could salvage of the split ones and used the salvaged amount plus 3 bags to patch two developing holes on the narrow section of Noakes Way. Photo number 1. Then onto East Gorse at the boundary where the largest of our muddy hole areas is. Someone had previously poured 6 bags of gravel into one hollow, but I've now opened and spread the remaining 46 bags. 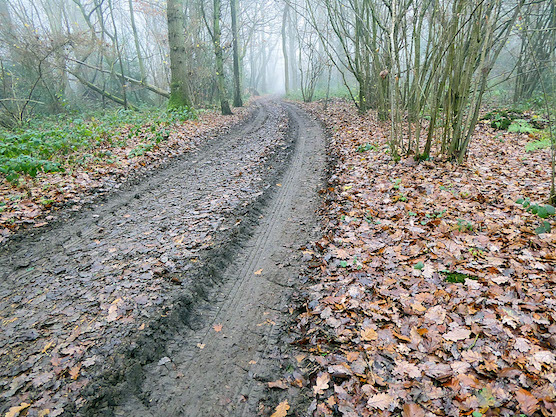 I haven't attempted to cover the full width, instead creating a wide enough path for two to comfortably walk side by side over the whole very muddy stretch. Both of the hollows have been deeply filled in and the total of gravel used here is 1.3 tonnes. Photos 2 and 3 show the two gravel colours, being from two sources. On the way there I smoothed the contractor's ruts at the crossing of Leafy Grove at the East Gorse exit. 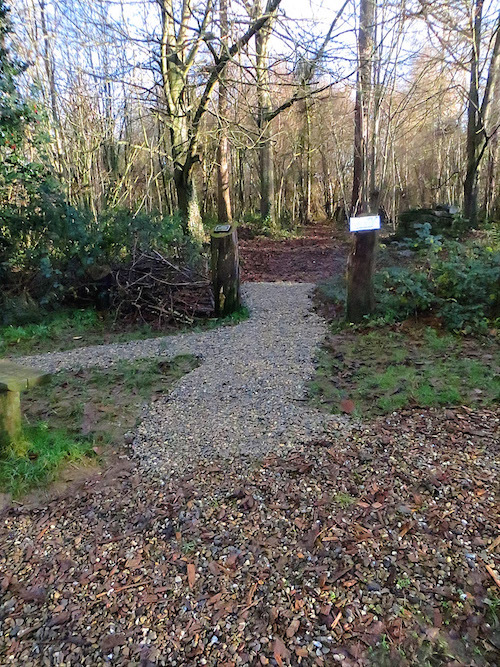 Walkers from East or Middle Gorses can now more comfortably cross to walk along the far side of West Gorse to the woodchip path link into Linden Grove. 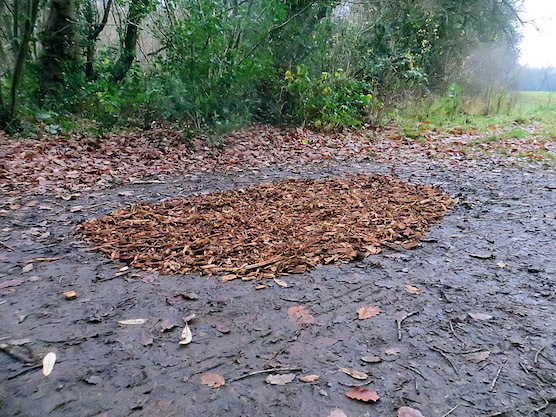 The 2 bags of woodchip were barely sufficient at the West Gorse - Smith Grove crossing, so with plenty of rain forecast for tomorrow I decided to strengthen the link today. 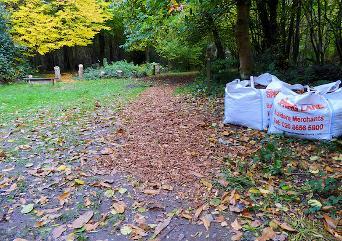 I tipped the woodchip store bag and filled four large bags which I spread over th exiting link, extending it. 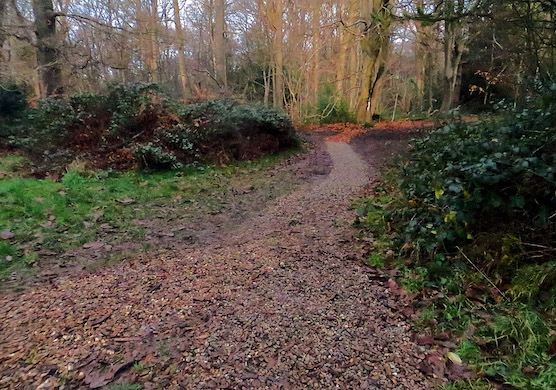 Then, since the remaining stretch into Linden Grove was sticky with mud, I collected bags of gravel and joined the woodchip crossing to the new Linden Grove paths to make a continous dry route through. Photo 5 is from West Gorse, but at an awkward angle not showing the new path width well since the sun was directly into the camera at the point I wanted to snap from. 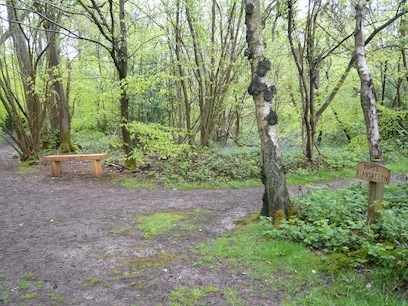 Photo 6 is from Linden Glade, and Photo 7 a longer shot from Linden Glade showing the junction of all three paths. I've tipped the woodchip store bag back upright and it's now just two-thirds full. The gravel store is down to 18 bags. Today loaded 3 bags of woodchip and filled the three Great Field puddles. 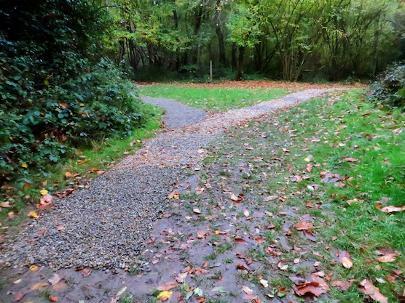 Then capped them thickly with gravel and treated three muddier path sections between the puddles with gravel. That section is now completed. The reserve was extremely busy with dog walkers so with that and my cold hands I called it a day. With it milder than expected today and much colder weather forecast I returned to the path work this afternoon. 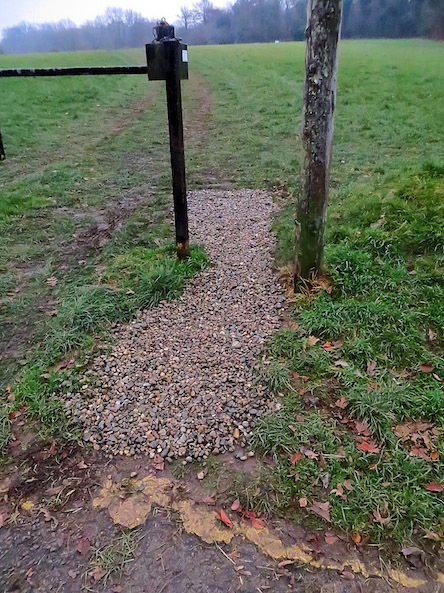 I've filled the Vale border entrance hollow with gravel, and since the lead in was treacherously slippery and banked, treated the approach as well. 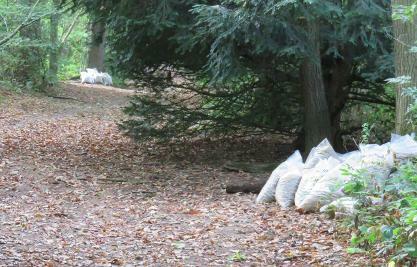 Eight bags of gravel used, photo 1. 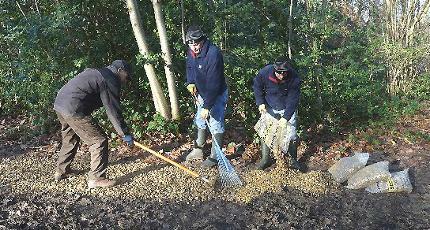 Then treated the very muddy Courtwood Grove corner lead-out with the last 9 bags of gravel, photo 2. To complete everything in that side of the reserve I went to the narrow point of Avis Grove and spread the 12 bags there, that shown in photos 3 and 4. With the exception of the Field 3 to Great Field entry which remains stubbornly dry at present, that's the whole project completed, so I'm attaching the updated report. I've towed the heavy empty wooden pallet down the slope and stored it behind the building past the store entrance. I'll speak to Paul about returning that, it won't fit in my car. Nearly 4pm by then and the sun just disappearing, so just got finished in time. Since the Field 3 to Great Field puddle had finally turned into soft mud and the weather is about to turn very cold, I completed that last area today. 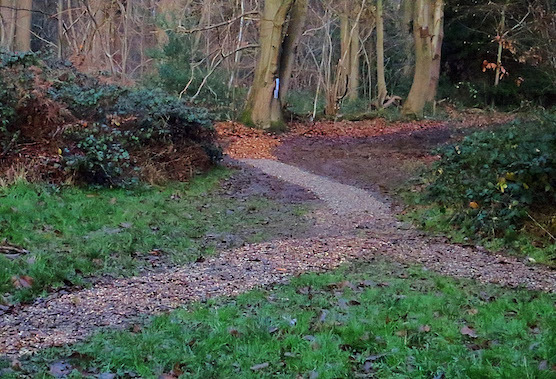 I used the last of the stored woodchip to fill the large muddy hollow and stabilise the mud, then thickly capped it with gravel to give some degree of permanence. The remainder of the 24 bags of gravel I used on the muddy lead in and out path. Photo right. The woodchip bag is behind the wooden pallet at the rear of the store building, both ready for Paul to collect. To assist in completing David's photos for the display I picked up 5 bags of gravel from Seccombe yesterday, and then as arranged by David met up with him and helpers this morning. 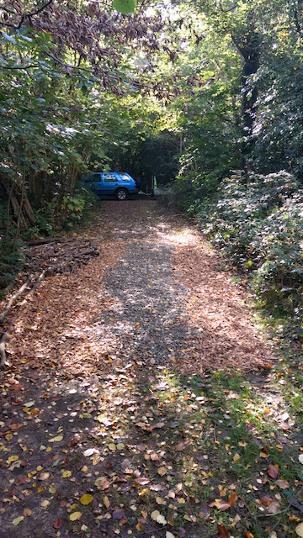 We laid a small strip at the Langfords Way end of Courtwood Grove while David took the photos below. Beneath is the final project report. I took advantage of the fine weather early this afternoon to clear that last half bag of woodchip. 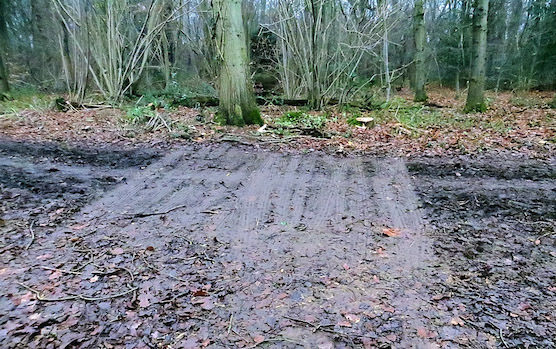 There wasn't enough to tackle one of the very bad spots and access is still too muddy and prone to damage, so I used it at the Great Field end of Courtwood Grove. I've put it on the right to help but it's only been of limited usefulness. 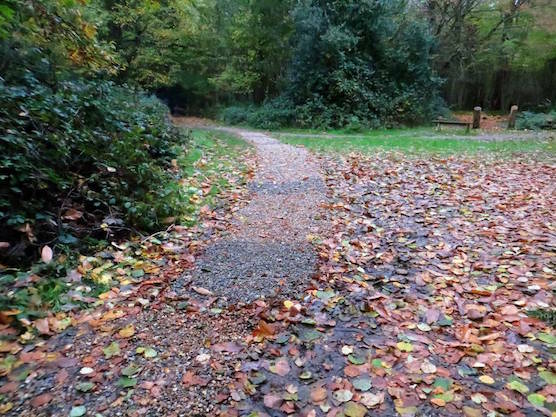 Photo of the path in Linden Glade shows a healthy sprouting of grass and plantain through the gravel, gradually returning the Glade to it's former all over green but with year round dry walking conditions. 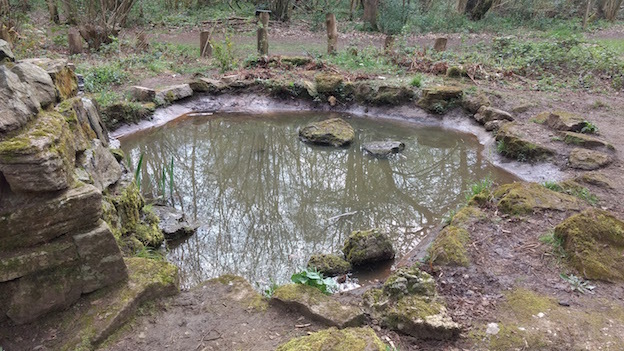 The memorial pool was fed by mains water and it disappeared when Croydon Council disconnected the water supply many years ago. 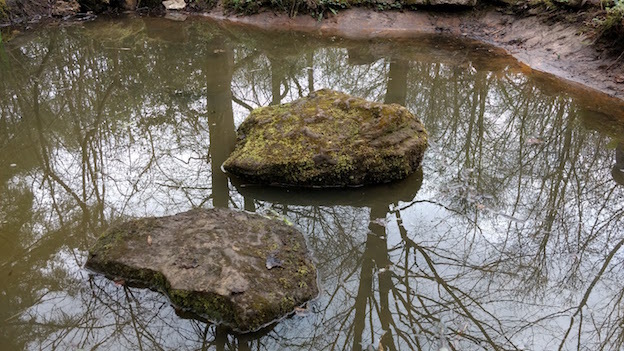 It had gradually filled with mud and leaf litter - so much so that some walkers have reported that they did not even know there was a pond in that location. 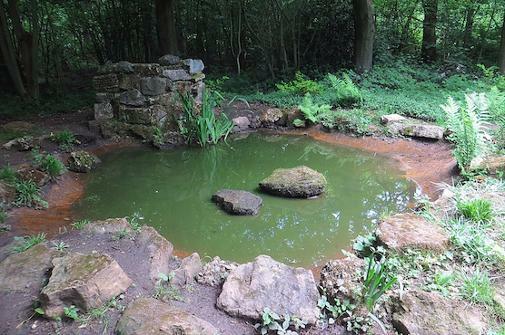 In the summer of 2016 the Friends decided to have a general clean up in the area in hope of restoring the pond. The work started in April and lasted throughout the summer months. To allow examination of the possibly cracked concrete liner all the surface soil was removed. 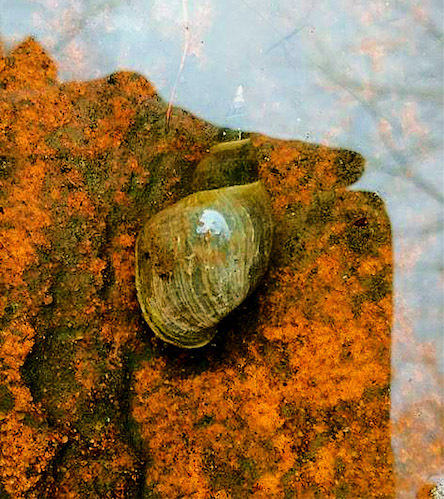 We discovered that the liner was filled with heavy mud with no animal life except worms. The Iris growing there were carefully lifted and put aside, and a start was made to remove some of the vegetation around the edge. 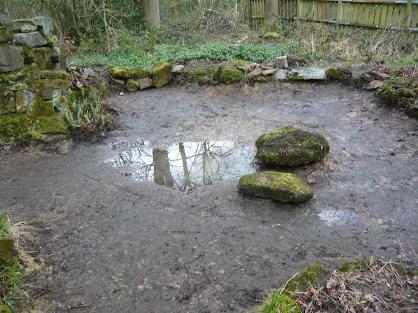 The plan was to clean the surface of the concrete to see whether we could make a repair and revive the pond. A newt was found sheltering under a rock. 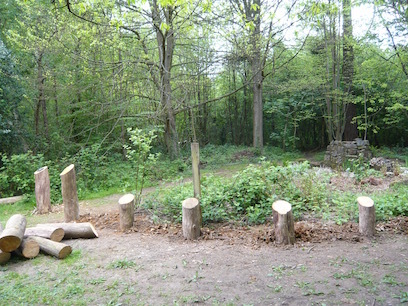 In May extra workdays were used to remove the old broken fencing and start the construction of a “henge” of logs to mark the boundary with taller ones to represent gateways to the pond area and house the explanatory plaques. The overgrown tangle around the pond was tidied and at least one species (bugle) seems to have taken advantage of the extra light and thrown up new shoots. Karen, Linda and Sharon concentrated on removing some of the vegetation around the edge of the dry pond. 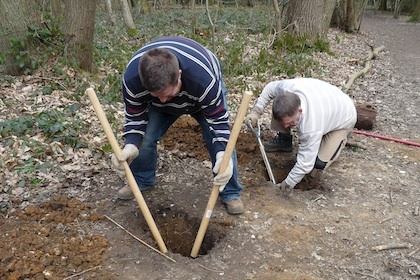 Neale, Jim and Mark took turns at digging holes for two large logs to represent an entrance to the pond area. David and Ted removed much of the rotted fence and stacked it out of the way until we can burn it at a later date. By the time we left the two gate posts had been erected and a large amount of vegetation had been removed. Neale and Jim also investigated some of the cracks in the pond’s concrete liner and they later revisited the pond to complete the clean and fill some of the worst cracks. The rainy spring meant that it was not possible to complete the repairs and sealing at this time. 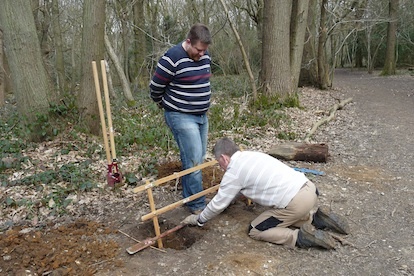 While Neale & Simon began working on the positions for two further "gate" posts, Ted used a mattock to make shallow holes for the four short posts. David started helping Karen with gardening then moved over to make the shallow holes deeper. In little more than two hours all six of the posts were in their correct positions. David took the opportunity to move an information board from the old fence to the top of one of the gateposts. Karen disturbed a frog in the vegetation and as usual the work was accompanied by an avian chorus. 22/5/16 - The old fence around the pond was removed by Ted apart from a few posts which were set in concrete, though two had rotted at the base and broke off as the fence panels were removed. Simon was eager to get started and began digging near the Holly where he was joined by Neale. David’s group arrived, as did Angus and John, and digging moved over beside the old fence to prepare to place four more logs, with Simon, Geoff and Angus involved. John & Ted started three more holes to continue the “henge” behind the Holly and were soon joined by the ever-active Simon who used the post-hole digger to smash through the buried flints. 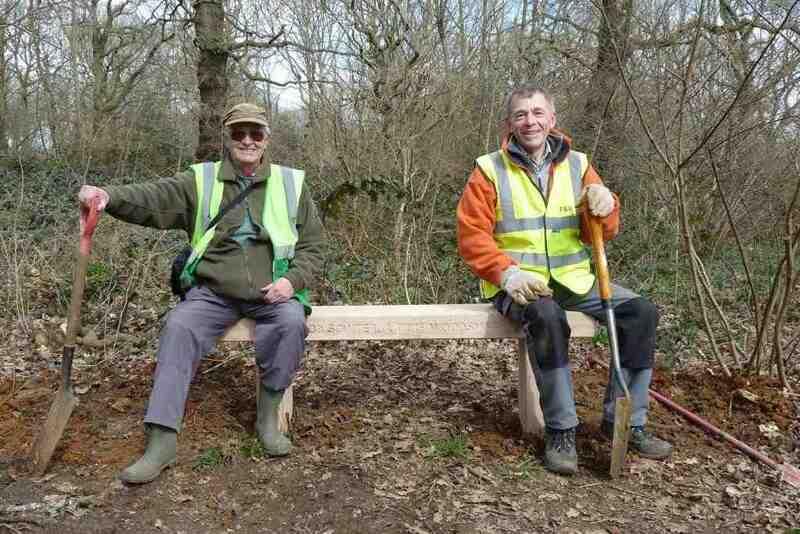 Geoff & Jim helped to complete the work. At some point Neale & Jim re-mortared a few more cracks in the pond liner. While all this activity was going on Karen did some magnificent work in tidying up the vegetation around the pond. Karen and Linda took several native plants to place around the pond, including Night-flowering Catchfly, Cowslip, Comfrey and Selfheal. 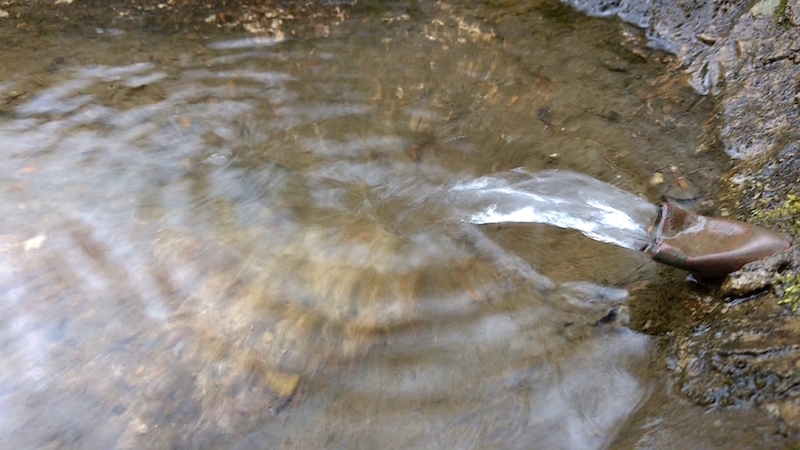 Neale investigated the water supply to the pond and confirmed that water is still available. 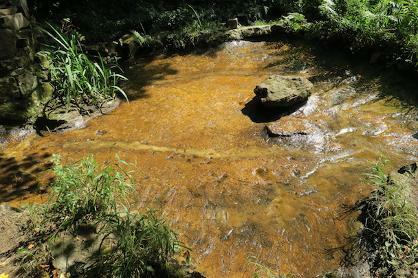 We planned to make enquiries with the water company and Council about the prospect of getting the supply restored. 7/8/16 - Neale, Karen and Jim went to Linden Glade where they removed several overhanging branches before attempting to remove mud and water from the pond in preparation for later sealing of the concrete surface. 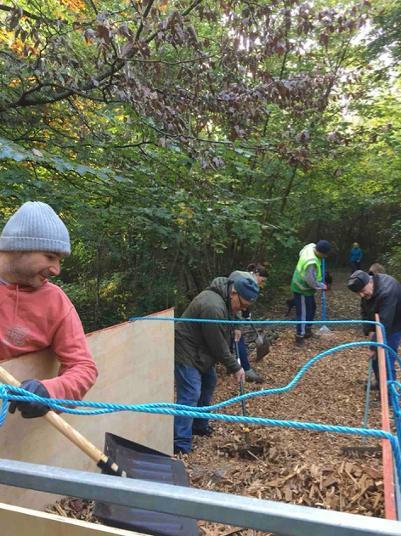 Tony, Ted, Karen and Neale took a trolley up to Linden Glade loaded with materials to seal the concrete surface of the empty pool. Earlier John Zareba had swept out the last remnants of the soil still present on the surface. By 10.30am Neale had started sloshing sealant on to the semi-porous dry surface, and for a short while was joined by Karen and Tony. The first coat was completed and left to dry until about 12.30pm when Neale began work on the second coat, making much more rapid progress as the surface was now much less porous. Another wait for drying to take place and the third coat started at 2.00pm and was completed in around 20 minutes. We left around 3.00pm, hoping that there would not be too many nocturnal visitors before the sealant was completely dry. Photos below show Neale applying the first coat and the completed job after 3 coats. 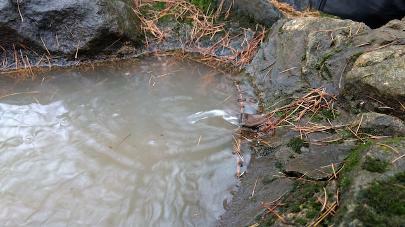 The pond is christened with the first rain since the sealing. (Photo taken Friday 19th August at 16.20 hours). 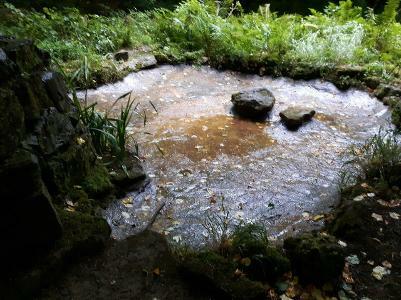 Rainy weather periodically throughout September meant that the pond never dried up and continued to fill throughout the month. Tony, Jim and Neale met the Sutton and East Surrey Water Network Inspector Martin Adcock to discuss the water supply to the pond area. The supply was turned on at the Vincent Avenue gate and the group then walked up to Linden Glade but no water appeared in the time they were there. 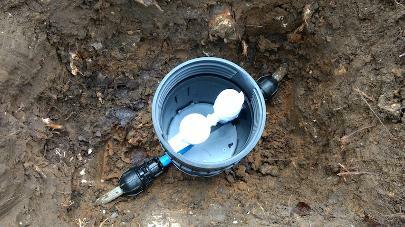 The Inspector examined the tap in Linden Glade and is recommending that it is replaced as it is faulty. He said the repair team do have location equipment so they might be able to trace the supply then as well. The FSW team mentioned that we had already had contact with his CEO, Anthony Ferrer, and he seemed confident that Mr Ferrer would not have a problem with this work being carried out. The pool is filling nicely with the seasonal rains. David put up a poster to remind folks not to throw stones into the pool as this could damage the surface seal. Docwra met Tony and Neale this morning and repaired the stopcock as promised. The flow is better but once isolated the meter is still running indicating the supply has a leak. We have isolated at the meter again. 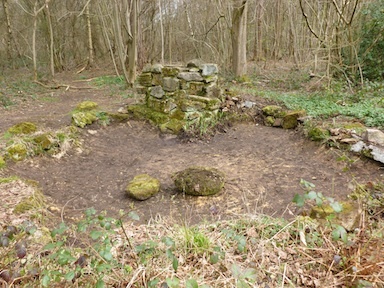 Pictures below from Neale Fox show: old broken stopcock (top left) water flowing into the cairn (top right) new stopcock (bottom left) and new stopcock cover (bottom right). 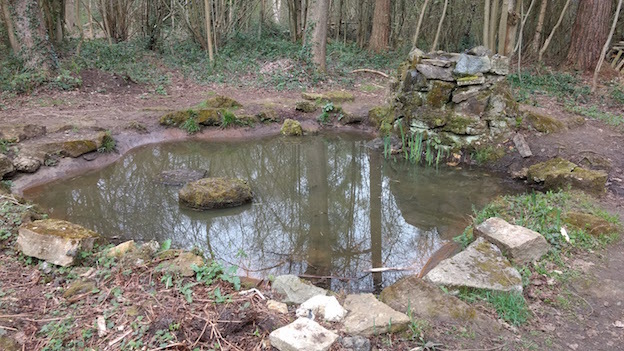 Pond has been topped up from the mains and the level is currently the highest it can go because the retaining wall to the right of the cairn needs repairing. 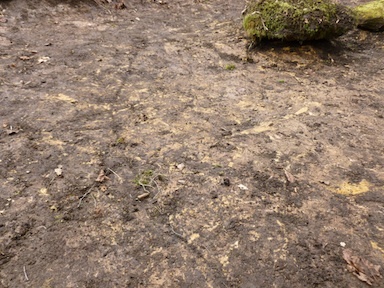 The excess water is soaking into the soil path but was stopped before it has turned into a mud bath. So around 6 units used. 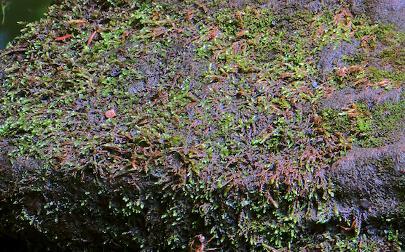 Linden Glade Pond - Not losing so much water by evaporation now that the Limes are in leaf and now very much alive, a rich green algal bloom starting the chain of life. 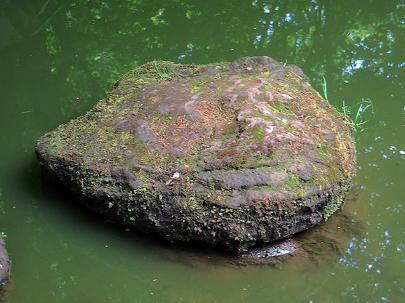 Even the rock in the pond is now showing signs of surface plant life, having grass and many tiny plants including green and brown algae and mosses. Top photo shows the whole rock and bottom photo a closer look at the detail. 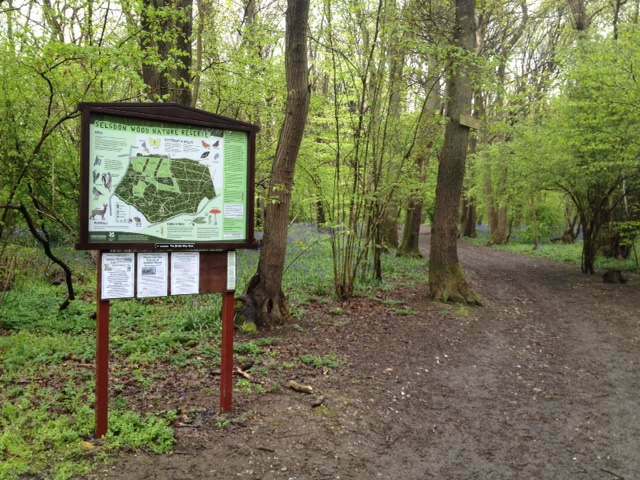 FSW have set up two trails in Selsdon Wood which are accessible on a mobile phone by way of QR codes. These codes are square patterns of dots which work in much the same way as the barcodes used for stock control in shops. 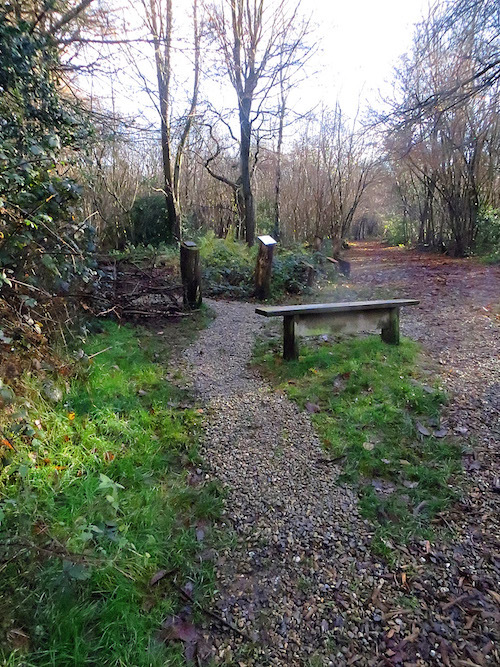 For many years there have been two trails (red and green) both marked by wooden posts and starting at the car park. 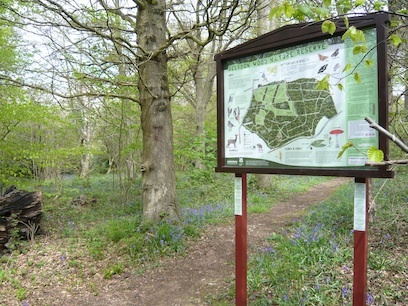 The numbered posts on each route now have QR codes attached and if these are scanned with a smartphone they display pages of seasonal information about the trail and an accompanying map. The original paper guide and the QR trails may also be accessed from the Walks page. If you use the QR trails we would be very interested in your feedback - do please get in touch via phone, email or website. To access the pages revealed by the codes click these links. 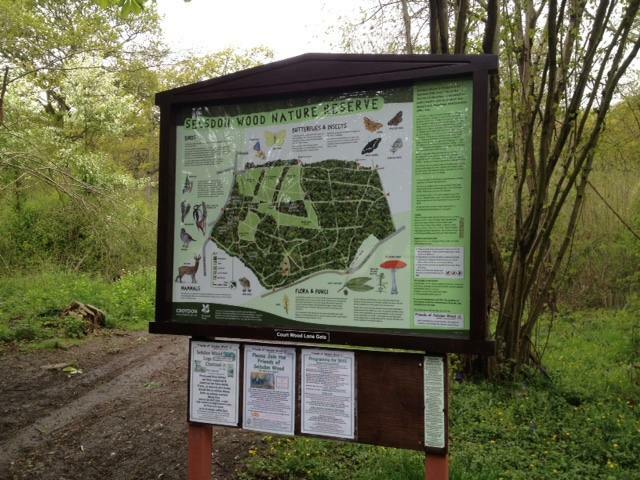 This project started when the FSW received two grants towards the cost of renovating six Council Information Boards. These created surplus FSW funds, so the Committee decided to buy four new benches. 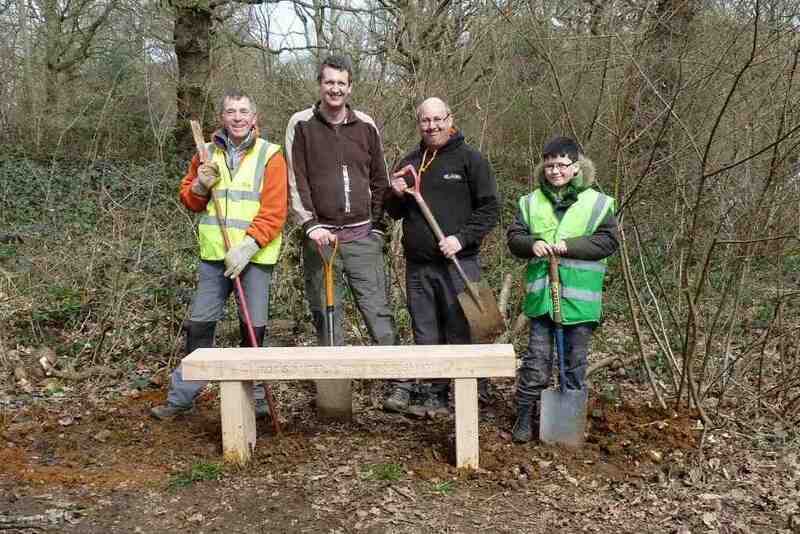 One to be engraved in memory of Rob Sowter who for years had coppiced an area bordering The Wend under contract from Croydon Council. He also taught FSW members about his craft and led our Charcoal Burning events. Three were to replace 40 year old benches that had rotted. 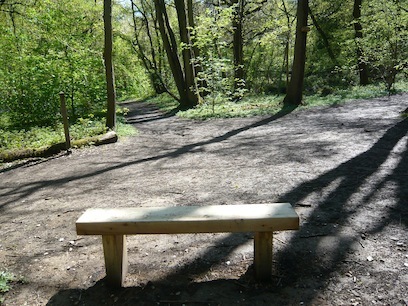 Then a member asked that a bench be installed to commemorate a friend who had enjoyed Selsdon Wood. So we ordered five 5ft green oak benches, with long legs for security. Over two weekends Alan Bushnell, his son John and I dug the ten 55cm deep holes ready for the benches. We used my homemade wooden gauge to check the depth. On delivery day we were lucky with the weather and the contractor delivered the 5 benches beside our first position in the Great Field. 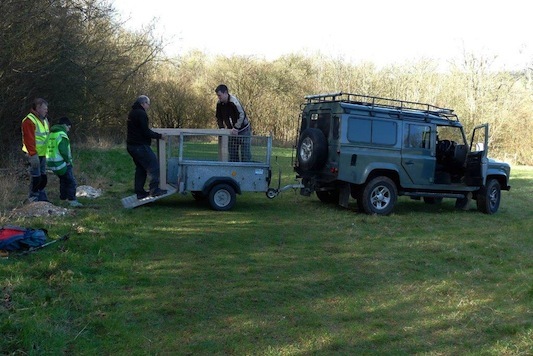 We were extremely fortunate to have the help of Ashley Green (Leader of 17th Purley Scouts), his son Nathan, friend Ken Jackson (Leader of 1st Selsdon & Addington Scouts) plus Ashley's Landrover and trailer. This made light work of transporting pairs of benches. 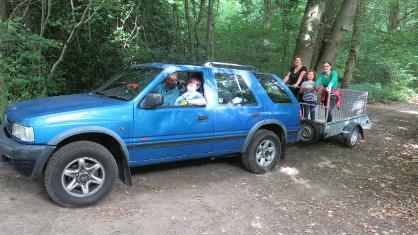 The deep mud of Avis Grove, tight corners and the steep slope in Noakes Way were not a problem. Thank goodness Ashley, Ken and Alan are younger and much stronger than myself. 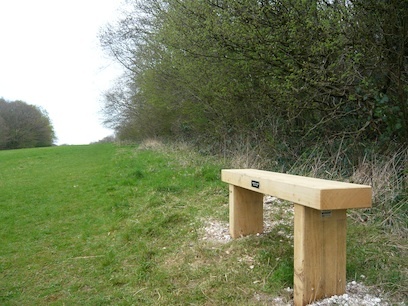 The benches weigh over 90 kilos each (200 lbs in old money) – as can be gauged in picture 2 below. They were carefully carried from the trailer and dropped into the leg holes. 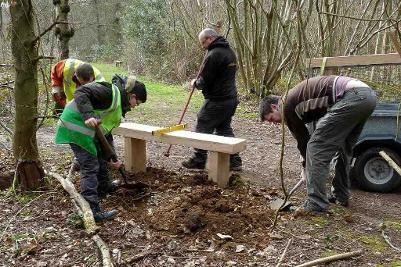 Then we levelled the benches and shovelled in and rammed down the clay and flints around the legs. 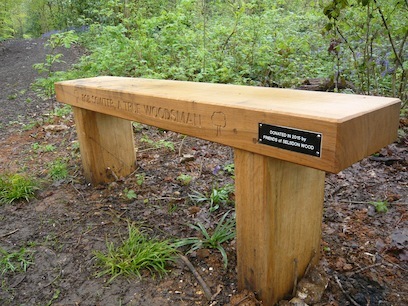 Plaques 'IN MEMORY OF G G LEWIS WHO LOVED IT HERE' and 'DONATED IN 2015 BY FRIENDS OF SELSDON WOOD' were fitted by Tim Lloyd. 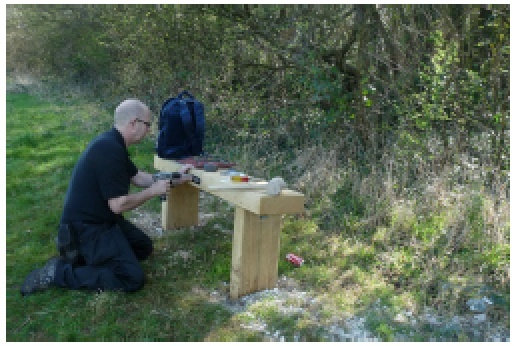 The gallery below shows all 5 new benches in place. Can you identify the location of each one? Most of the notice boards at the 6 entrances had been subject to vandalism or attempts to set them alight and graffitti removal had made the polycarbonate opaque. Some information was out of date and some wooden frames had rot and were coming apart. 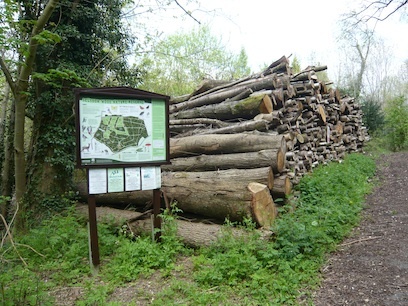 During 2013 the FSW had attempted to interest Croydon Council in renovating the boards but realised that this was impossible in the current financial climate. 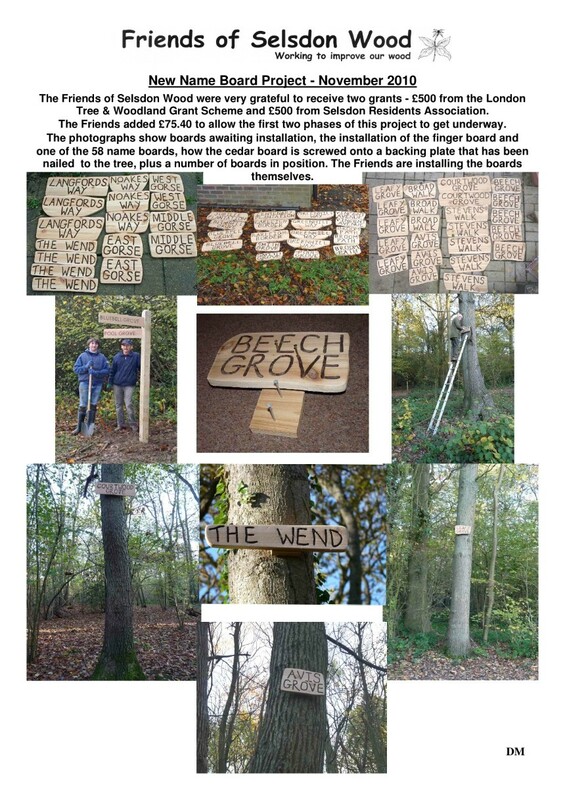 In early August 2013, a meeting in the wood between Heather Govier (FSW Chair) and Meike Weiser (Croydon Community Partnership Officer) suggested that the FSW should take a board apart to see what was involved in renovating them. David Malins, John Zareba and Sid Potter dismantled a board. It was concluded that it was not possible to separate the poster and the clear polycarbonate layer without damaging them. Replacement was the only option. David took on the job of designing a new poster and coordinating the project. The first step was to produce a draft design and cost the renovation process. 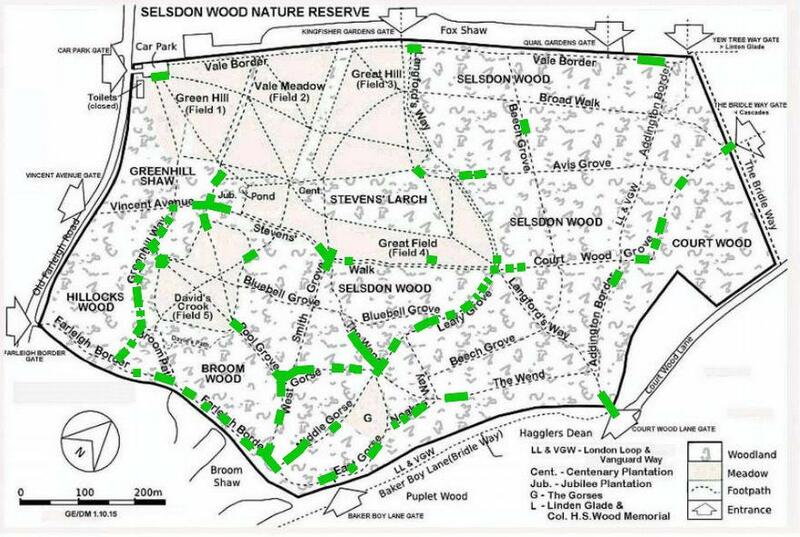 After considering several options it was decided that a new poster should be designed around an updated map that had been produced for a Council Selsdon Wood leaflet (the copyright was owned by the artist). The FSW would then see if they could afford to pay for it. By February 2014 David had produced a draft design for the 1145mm x 850mm poster and during subsequent months the FSW Committee and Meike helped to detail the copy and pictures. Croydon Council had obtained a quotation of £4,572 for dismantling, taking away, renovating, printing 6 posters including 6 'YOU ARE HERE >'s, and reinstalling the 6 boards. Adding origination of artwork (£520) and 8 gate name boards (£167) this came to a total cost of £5,259.00. (These and subsequent prices include vat). The FSW Committee was convinced the project could be completed cheaper. During subsequent months David refined the design and copy and looked at alternative printers and alternative board material. The final choice was 3mm aluminium composite DiBond for durability with the quality of Eco-UV print. Foamex was rejected because our own tests showed it expanded with heat and the print had less impact. Poster paper was rejected as not durable enough. By July 2014 FSW estimated that we could renovate the boards within £350 which included 6 new polycarbonate sheets. Neale Fox volunteered to act as foreman with Jim Dunning's assistance. 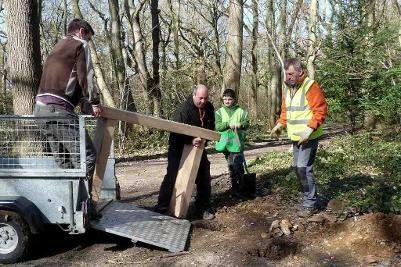 Sid Potter volunteered the use of his garage for renovating the 3 boards from the north end of the reserve, the other 3 being renovated in the FSW store. FSW presented the proposed design, action plan and cost esimates to Croydon Council who agreed to allow the FSW to negotiate with the suppliers direct, subject to Council approval. 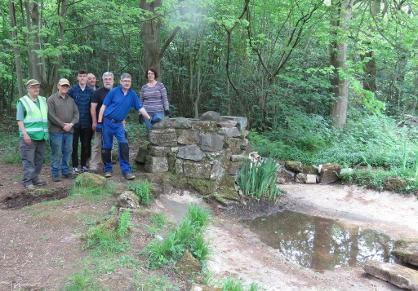 The Council thanked FSW for funding the project. David submitted his brief to the artist and ordered the gate name boards. At the beginning of October 2014 the artist completed her first artwork proof. After amendments this was cleared to the printer and printed by the end of November. Sandra Crapper had made submissions for grants to Selsdon Residents' Association and Croydon Council. The FSW was very grateful for the donations - SRA £520, LBC £500, Totaling £1,020. Neale & Jim with David, John and Karen's assistance continued the long job of dismantling, repairing and treating the wooden frames. A blowlamp was required to burn off rot and D/S tape used to attach posters to the back plate and to free screws. The bottom bar of one frame was replaced. Most of the frames had some rot and this was stabilised with Ronseal Wood Hardener and then painted with Sadolin preservative. We were grateful to John Bickerstaff for the use of his Brother P-Touch label machine to produce 'YOU ARE HERE >' labels. The new poster and polycarbonate sheets were sealed together with metallised tape before being mounted back in the frames with silicone sealant. The completed frames were then bolted back onto their legs and their backs repainted. 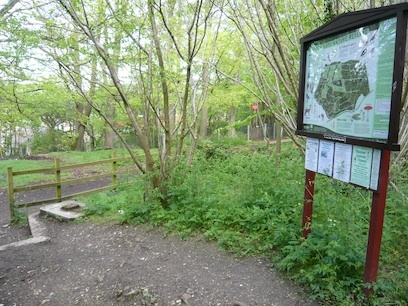 By the end of February 2015, the first complete Info board was put up by the car park. The project had taken 18 months. 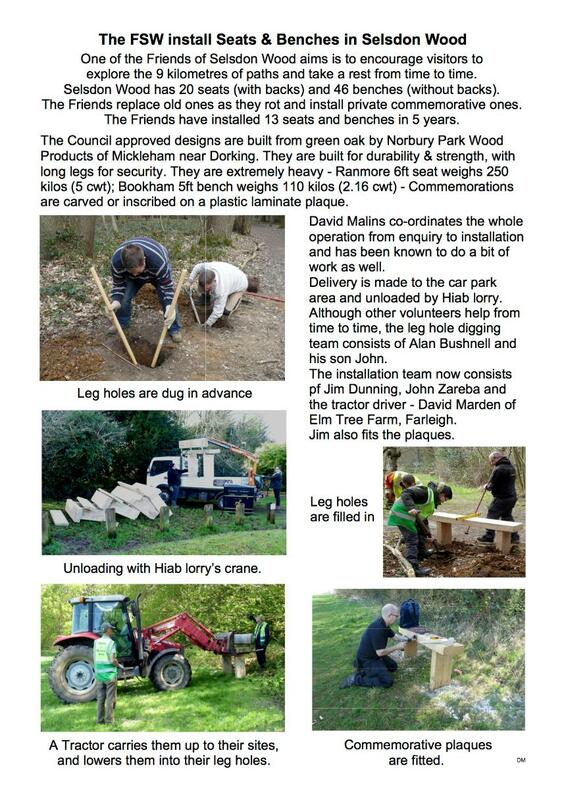 Rounded FSW project cost £1,310 (£190 under estimate); generous grants have covered £1,020 of this. By taking on the renovation work ourselves the FSW have saved nearly £4,000. 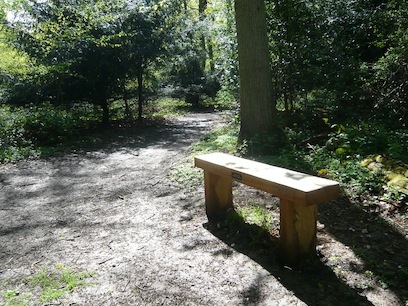 As the FSW had budgeted to pay for the complete project, funds can now be freed for our next Project – 5 new benches in Selsdon Wood. The photo to the right shows the new notice board in the car park. Can you identify the locations of the remaining 5 boards shown below?